Fabio Buzzi, CEO OF FB Design, piloted on Lake Como a “three point” motorboat, reaching the record speed of 277.515 km/h. The boat, conceived, designed and built by FB Design, was equipped with a Cursor 16 engine produced by FPT Industrial for agricultural applications, adapted and tuned for the project. Lake Como, Tuesday, March 7, 2018. In front of observers from the Guinness World Records, the engineer from Lecco pushed the futuristic red “three point” motorboat to the speed of 277.515 Km/h. After verification with readings and measurements precise to one thousandth of a second carried out exclusively by electronic means, the record was recognised as official by the observers. The boat speed record is held over a measured cause of 1 km or one nautical mile with at least two runs in both directions, one up and one down, in the space of an hour: the final result is obtained from the average of these runs. The record is recognised if the value of the previous one is surpassed, and in this case it was held by Buzzi who had clocked a speed of 252 Km/h in 1992. Planning a record means developing an engine, designing a new hull with a new structure (the first drawings date back to January 2016) and studying the most advanced composites. “The real reason behind the record,” says Buzzi, “was this: to develop a top of the range marine engine for FPT. In fact, right from the start, we proposed a modular series of engines of 600, 1000 and 1300 hp based on this block.” The idea was to start from a 16 L FPT diesel engine block made for the big CNH combine harvesters, the Cursor 16. Its characteristics included: steel pistons, flywheel side distribution, block into pieces (without single supports), common rail inside the head. 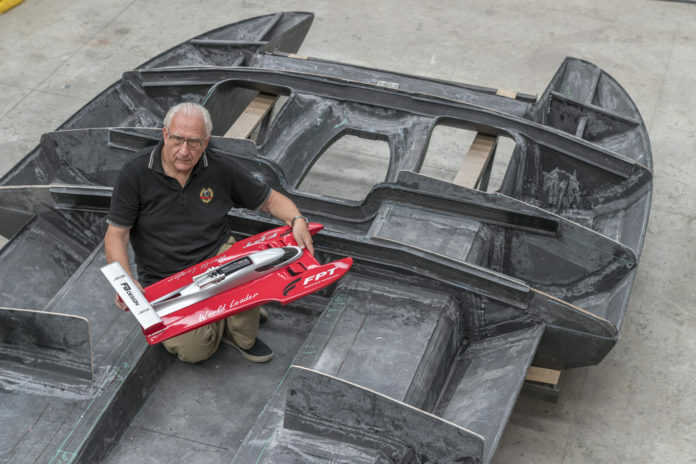 And so Buzzi managed to get the support of FPT in developing a version of the Cursor 16 to beat the world speed record for diesel motorboats. The catamaran was discarded as a solution: “it would have been okay up to 250 km/h, but beyond that it would have been just a balancing act on two points side-by-side, with the air tending to lift the boat and the weight tending to keep it down, but not always winning!” So FB opted for a “three point” hull with the centre of gravity amidships which, they felt, gave an equilibrium that was always stable. The engine develops 1800 hp. The boat together with its pilot needed not to weigh more than 2600 kg. This meant the hull could have a maximum weight of 450 kg. So obviously we needed to use Carbon / epoxy / Nomex”. The models and moulds of the “three point” hull were made using the large five axis milling machine of more than 20 m at FB, and so were mathematically perfect and exactly symmetrical. “Personally, having been in the past a ‘Kevlar man’ with Dupont, I don’t much like carbon because of its classical catastrophic breaking,” says Buzzi. The choice of carbon fibre for this particular boat was however a consequence of the consideration that it would have very little vertical acceleration (“all F1 cars are rightly in carbon, all rally cars are in Kevlar”). The transverse structure is in carbon beams pressed in the autoclave, while longitudinally it has “boxes” in the deck that are glued to the bottom, and so with a very high elastic module. These boxes are filled with Eva, a very light polymer that does not absorb water and so ensures that the boat is unsinkable. The hull is laminated with pre-preg and has a core in Nomex honeycomb, and is baked again in the oven at more than 100°C. To prepare for the record, the compression ratio of the engine was lowered. It was also given a new extruded collector in aluminium with a sliding internal core in adiabatic Inconel and, later, a stainless steel welded collector was made for the two variable geometry turbines (VGT). Alfa Laval specially made the extruded heat exchangers with copper piping and finning also in copper. FB made all the collectors, moulded in rapid prototyping, and the direct thermostatic water circuit. The cooling system is guaranteed by a single circuit with an innovative solution with the water intake inside the titanium rudder. The research and development centre of FPT Industrial in Arbon, Switzerland, optimised and ran in the engine on the bench, potentiating the injection system and giving it an exclusive and complex dataset. And so from the initial 825 hp of the standard engine, the new version developed 1800 hp! The transmission used is in-line in 17/4/PH steel, supplied by Radice with a surface piercing propeller rotating at 10,000 rpm, thanks to a multiplier, made for the occasion by FB Design, with a 3.7 overdrive ratio with self-aligning joints. The direct cable helm is hydraulically servo assisted, and hence has no play, an indispensable requisite for these speeds.